Sang Tao understands the need of installers working on through to heavy duty plumbing for multi purpose applications such as chemical treatments plants, mechanical or fire protection projects, and supplies the necessary clamps, accessories or custom made equipment to help get the job done in timely and efficient manner. Our Support Strut System can be assembled very rapidly with minimal tools and only moderately trained labor, which reduces costs significantly in many applications. We offer a wide variety of Channel Struts. Thay can be provided in plain style, slotted with evenly spaced slots along its length, or in a range of different welded combinations. Materials and finishes include Pre-galvanized steel, Hot – dip galvanized (HDG), Powder coated (PC), Stainless Steel 304, 316. You can click on Support Channel for viewing more details. Channel Nuts are one of the main components of our strut system. 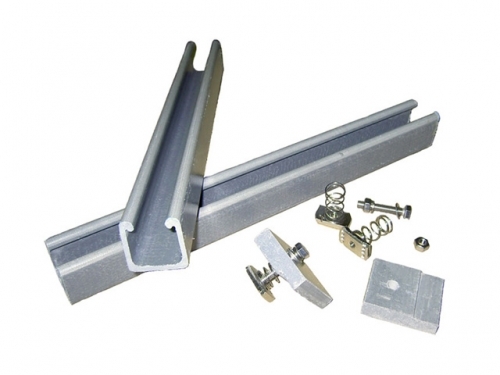 Channel Nuts make securing items onto lengths of strut an easy process. They have serrated edges that help hold them in place against the people of the channel strut itself. Spring channel nuts including Long spring, Short spring and No spring with variable materials and finishes as Hot-dip galvanized, Electrogalvanized, Stainless steel 304, 316. You can click on Channel Nuts for viewing more details. Sang Tao's Vertical Bracket Struts provide a reasonable and versalite method to support cable ladders, cable trays, cable trunking,... across vertical walls. These can be fixed easily onto Channel Struts for easy adjustment. Length can be varied, depends on customer's requirements. A range of material thickness are also available, and we can support with choosing the correct one depending on your requirements. You can click on Vertical Bracket for viewing more details. 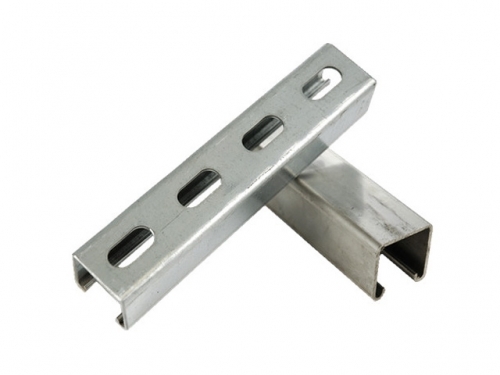 Concrete inserts are manufactured from carbon steel meeting physical requirements. Concrete inserts have lugs punched along them to help install it into wet concrete. For easy installation, a foam insert keep the internal section of the channel clear, and is removed upon completion. Standard finishing is Hot-dip galvanized (STSM – A123M). Insert lengths range from 300mm to 3000mm with resonable widths. You can click on Concrete Insert for viewing more details. We manufacture many kinds of Flat plate fittings suiting in variable application. Flat plate fittings are Hot-dip galvanized conforming to ASTM – A123M or Electrogalvanized. You can click on Flat Plate for viewing more details. Base plates are generally used to fix vertical lengths of channel section to a firm floor and are generally connected to channels in many ways. Base plates are Hot-dip galvanized conforming to ASTM – A123M or Electrogalvanized. You can click on Base Plate for viewing more details. Beam clamps are manufactured to suit a wide variety of applications and reduce in site installation costs by eliminating the need to drill structures in most cirumstances. Beam clamps provides a connection that can be both permanent or temporary and allows for on site adjustment. Standard finishing is Hop-dip galvanized or Electrogalvanized. You can click on Beam Clamps for viewing more details.